I love themed parties! Every year we like to watch the Nightmare Before Christmas as a family. Every party is more fun when it's themed, so this year I made invitations, cookies, and dressed up for the movie. 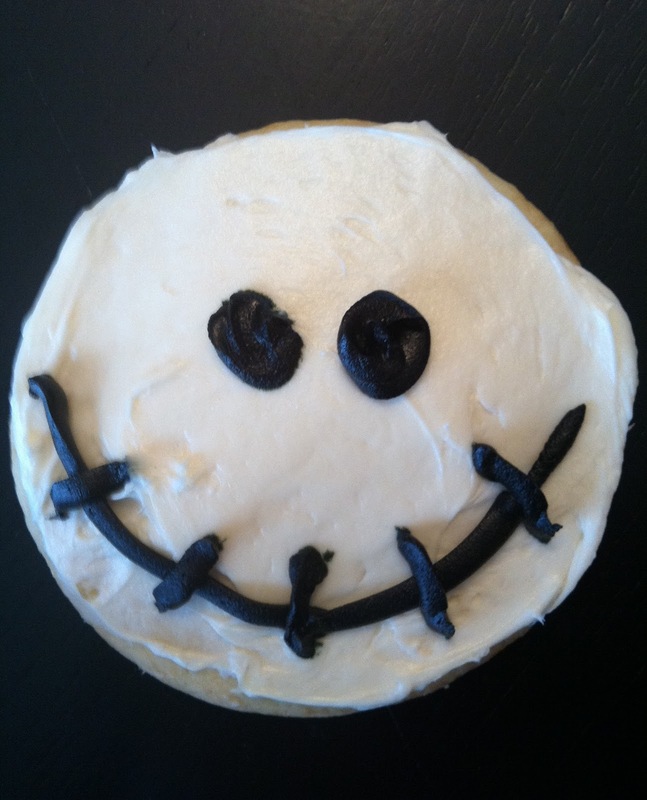 To make the cookies I just made sugar cookies, frosted in white, and piped on a smile and 2 eyes. It was really easy. I recommend just buying a tube of black frosting, since it's really hard for me to get a true black using food coloring. The cookies were a huge hit. I love this recipe because they are so soft, sweet, and moist. Best homemade sugar cookie recipe I've found. Elliot and I dressed up as Sally and Jack from the Nightmare Before Christmas a few years back, so we already had costumes. 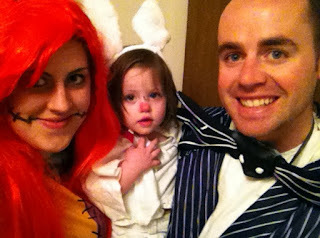 For Lily's costume as Zero, I dressed her all in white, added a white cape and bunny ears that I put on backward, and painted a pumpkin on her nose. Ok...now time to make it easy for you to have a party of your own. 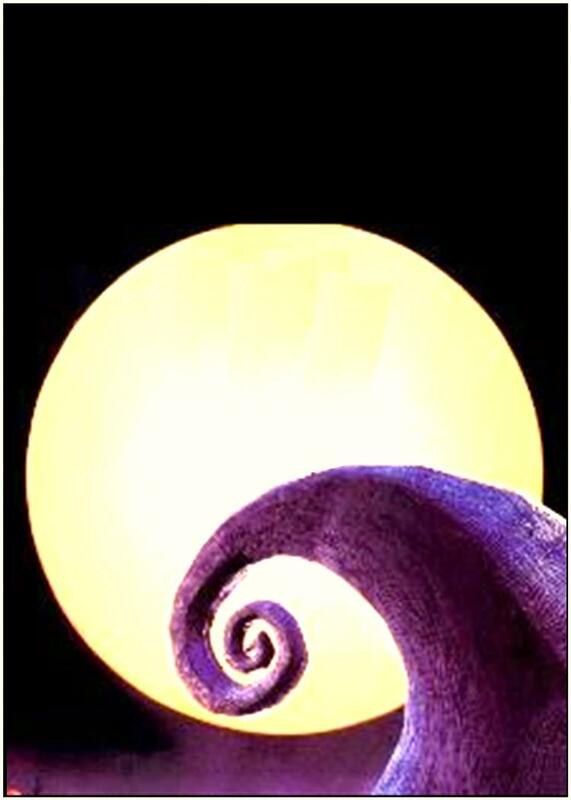 Below is the jpg file I created for the invitation. Want to make your own? Save the jpg file, and use a photo editing software (or even Microsoft Publisher or Word) to add words. I used the font "MATTEROFFACT" for the "You're invited" part. I used Microsoft Publisher (I really love that program) to do my invitation. If you just want to use my template using Microsoft Publisher, you can download it for FREE here. So cute. I LOVE a good themed party and wish we had more of them. Nobody sends out invitations anymore. It's a downright shame. Stopping by way of a linky party. I love the invitation too!! PS. I'm excited to host my first ever real giveaway -- if you'd like, come by and check it out! 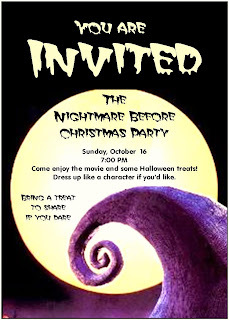 We're big fans of The Nightmare Before Christmas here, and your party looks absolutely wonderful! Awesome how you guys dressed up as Jack, Sally and Zero! Great invitations with that classic background scene, and perfect cookies! Happy to have found you through the party at The Southern Institute! Very cute cookies and oh so easy! You had loads of fun! I love those cookies... such happy skeletons! Thanks for linking up this week. I can't wait to see what you link up next week! 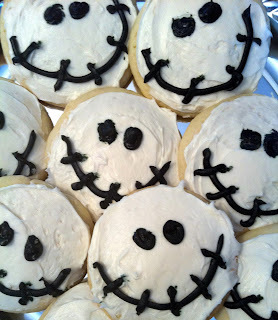 Great party idea...your costumes and cookies are too fun! So glad you linked up to the Tuesday To Do Party! 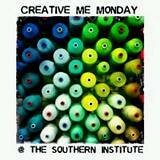 Thanks so much for linking this fun idea filled post to Motivated Monday at BeColorful. I hate to admit that this is a movie we have missed. You have inspired me to make it a definite do this year. Great theme, speaking from a dark fiction author's point of view. Found you through Allie's Making It.